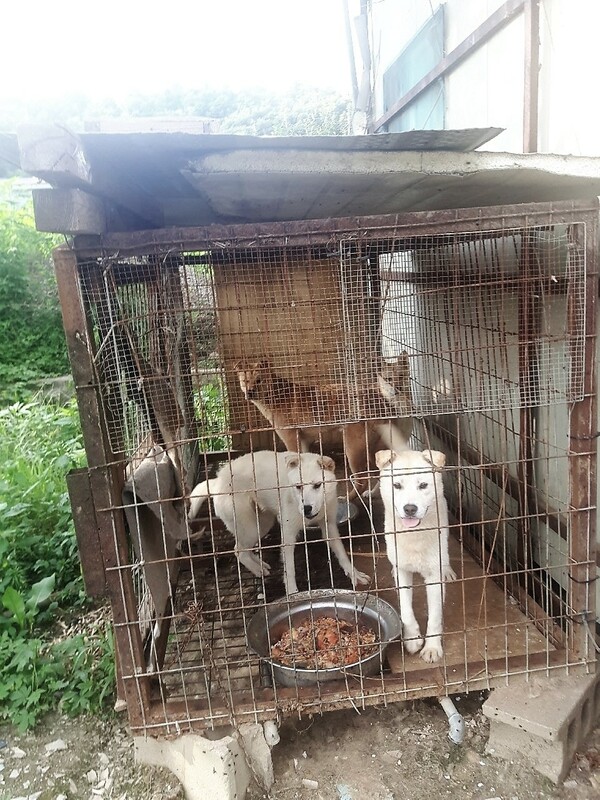 Siheung, South Korea, Shut down the illegal dog meat farms, slaughterhouses and markets. Home / Blog / Siheung, South Korea, Shut down the illegal dog meat farms, slaughterhouses and markets. In Siheung, there are countless dog farms, slaughterhouses, markets and restaurants where the dogs, who are tortured their entire lives, end up being slaughtered in the most inhumane ways, such as by electrocution, hanging or beating; and then thrown into boiling water – sometimes while they are still alive. In many places, dogs are being killed in full view of other terrified, caged dogs; and this takes place in broad daylight. In addition, many abandoned and stolen former pets end up in this industry, and are subjected to the same cruelty. Video: A dog farm in Siheung, South Korea. Korea Animal Welfare Association. A Search Engine reveals the sickening scale of Siheung’s dog meat demand. The searches resulted in: 384 Health Food Shops; and 247 restaurants in and around Siheung. Even if half of these ‘Health’ Food Shops and restaurants serve dog and cat ‘ingredients’ in one form or another, just imagine how many dog/cat slaughterhouses must be present in and around Siheung in order to supply all of these outlets. Please sign petition, call, write and email the Siheung Mayor and the City Council TODAY! Subject: Siheung, South Korea, Shut down the illegal dog meat farms, slaughterhouses and markets. Petition: Siheung, South Korea, Shut down the illegal dog meat farms, slaughterhouses and markets. Please stop this inhumane barbaric dog meat industry. Be and set an example for the world. Why are you killing man friend. It’s the most loving animal God gave us. How can you look in there innocent faces and do this evil. Has to stop now…please ! How can you do this evi to God’s best friend. You will be judged in the end. How can you look in the eyes of God’s best friend and do this evil. You will be judged in the end. What type of society are we if we allow the BEATING, KILLING, and EATING of DOGS AND CATS??! THESE ARE DEFENSELESS ANIMALS!! Where is our COMPASSION if we permit these INNOCENT ANIMALS to endure a lifetime of HORRIFYING, BARBARIC, TORTUROUS and UNIMAGINABLE PAIN??? Where is the greatness of our nation when our LEADERS have turned their backs away from this INHUMANE AND INCOMPREHENSIBLE ABUSE that is INFLICTED to these ANIMALS every second of their lives and ALLOW THIS TO CONTINUE WITHOUT ENFORCING LAWS TO PROTECT OUR ANIMALS FROM ABUSE, SUFFERING AND CRUELTY? PLEASE I IMPLORE you to STOP this SAVAGERY and show the world your CULTURE is better than this!! !